Do You Ever Feel Truly Ready To Take Your Driving Test? The day for your ultimate road test is fast approaching and you can’t help but have a gut feeling that you can’t explain. The closer you get to your driving test, the more intense it gets. On top of that, the ‘what if’ questions start to overwhelm your mind regardless of how many times you’ve practiced. On the bright side, you’re not alone and most people get that feeling a few days to the road test anyway. Feeling ready is a state of mind and confidence is a key ingredient. But still, do you ever feel truly ready to take your driving test? Well, it depends on who you ask. There are those who admit they have never felt ready for the road test yet their friends will tell you otherwise. Nevertheless, if you feel you’re not yet ready, it could be very likely because of the following reasons. You could be doing everything by the book but as soon as you book a driving test, you start to doubt whether you’re ready or not. In fact, feeling anxious or nervous is the most common reason why most people don’t feel ready to take a driving test. There are even those who report feeling sick due to extreme nervousness prior to the test. Is your heart racing too fast when you’re behind the wheel? Are you holding the steering wheel too tight? Are you thinking too much? Are your hands shaking when driving? Or is that you were driving just fine on your own until you got into the vehicle with the examiner? Whatever it is, if you’re feeling like a nerve wreck during the driving test day then you need to get yourself together…..Or else you will have to explain to your friends and family why your driving license is taking longer than expected. Just because your dad told you he only took 2 days of practice to pass the road test, it doesn’t mean you have to go through the same process. Times have changed and things are more complicated nowadays. Make sure you have practiced driving through different terrains and conditions until you feel confident enough to drive alone without your instructor. Of course, you are not ready until you know how to make all turns on the road, maneuver through a roundabout or an intersection and parallel park without making a mistake. You can always schedule a mock test before your ultimate test to know which areas you should improve. Unfortunately, there are candidates who have their confidence crushed by their driving school instructor. You know the instructor with a bad attitude? To make matters worse, there are instructors who are constantly shouting at their students for the smallest mistakes. If you feel like your instructor is only making you feel uncomfortable, don’t hesitate to request a new instructor at the driving school. 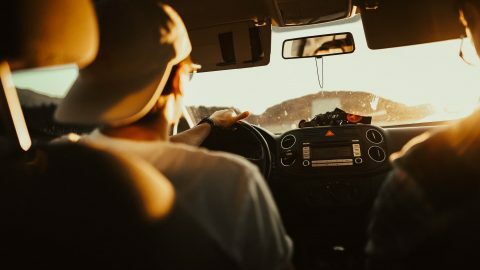 However, it is not advisable to always blame the instructor for your mistakes but you can’t ignore the fact that there are a lot of beginner drivers who claim they only felt confident enough to take their road test after changing the driving instructor. A little bit of fatigue will make you feel dull for the test. Too much coffee or energy drink will not help the situation either. In fact, it will probably make it worse and your mind will switch into panic mode. That’s why it is important to get at least 8 hours of sleep before the road test day. It is also crucial to schedule the test when your mind is usually more alert. Your sleeping pattern usually dictates when your mind is more alert. If you’re a morning person, it would be suitable for you to schedule the test during morning hours. But if you’re used to waking up late and being more active past midday, then what better time to do your test than during the afternoon? Still not sure whether you’re ready or not to take the driving test? Go out with your private instructor, family or friends who are experienced drivers and let them evaluate your driving skills. Ask them if they think you’re ready. In most cases, the mind creates an illusion that you’re not ready for the test while in fact you would ace it under the right conditions. As long as you have done numerous driving maneuvers that are to be expected on the road test with very little error then you’re almost there. Don’t think too much about it. All you need to do is be 100 percent confident that you will pass and you will start feeling ready to take the test.